The subsurface water retention technology (SWRT), developed by MSU professor Alvin Smucker, is a complicated name for an ingenious and surprisingly simple concept. Think about what happens when a field of crops receives water. The water travels down through the soil and gets soaked up by the roots, but some water gets past the roots and is lost to the earth below. This is an especially large problem in dry, sandy soil, like that in drought conditions. Smucker’s SWRT utilizes membranes placed at various depths under the surface which retain water and redirect excess water toward other roots in the process. This way, the plants can better capitalize on every drop of water. These membranes are much more efficient than the previously tested asphalt barriers; they are far faster to install and last longer than their rigid counterparts. 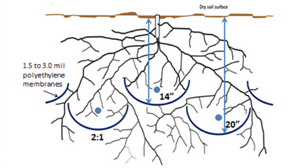 Also, since they are flexible, they can work around root systems to more effectively direct water to the right places and change as roots grow. Preliminary test runs show the membranes allow for 145% more cucumber yield and 175% more corn yield in sandy soils, according to a MSU article. The membranes can be used to promote agriculture in places previously unsuitable for growing in addition to protecting against dry spells. With that in mind, Smucker and teams of scientists and engineers will focus next on implementing SWRT in semi-arid and arid regions of the southwestern and midwestern U.S., where farms are still recovering from last year’s heat. Biotechnology Calendar, Inc. is proud to host its East Lansing BioResearch Product Faire™ on the Michigan State University campus on July 18, 2013. For over 20 years, Biotechnology Calendar has produced top-class research tradeshows nationwide. These shows are designed with life science researchers and laboratory suppliers in mind. If you’d like to attend our East Lansing event, please click the button below, or see our 2013 schedule for a wider geographical selection.